The Indians took hold of the silver chain of Cartier's whistle and pointed up the Ottawa. Cartier brought back from his voyage of1534 none of the gold or precious stones which every explorer sought. The two young Indians were his only trophies. From them he hoped to find out more about the countries he had visited, when they and the French had learned something of each other's languages. But he had gained much knowledge of the coasts of the new land, and had seen the wide sweep of the river that poured from the west. He had found the greatest opening along the Atlantic Coast. Nowhere else did so broad a flood of waters break the barrier. With better equipment, a second attempt might carry him to the shores of Asia. His report won the further support of the king. He was given three ships, provisioned for fifteen months, so that he might be able to spend a winter in the new land and push on to further discoveries in the next year. On the 19th of May, 1535, Cartier and his company, numbering one hundred and twelve, set sail from St. Malo, after they had made confession, attended mass and received the blessing of the bishop in the cathedral. His largest ship was of one hundred and twenty tons burden, and among his company were several gentlemen adventurers and the two Gaspe Indians who were to act as guides and interpreters. The voyage was long and stormy, the ships lost sight of each other, and it was not until the 26th of July that they met again in a harbour at the western end of the Straits of Belle Isle. Thence they sailed up the river, past the Saguenay to the Island of Orleans, which Cartier named the Isle of Bacchus, on account of the great quantities of wild grapes which he found growing there. On this fertile shore he landed, and met the Indians, who brought him a bountiful supply of corn and pumpkins from the fields which they cultivated. By this time Cartier had learned that this great fresh-water river could not be the passage to Asia. Disappointed though he was, doubtless he began to realize that he had discovered a great country, where grew all manner of fruits and vegetables, covered with forests, abounding in ur-bearing animals, and possibly full of precious minerals. By the middle of September he reached the Indian village of Stadacona, where to-day stand, the picturesque city of Quebec. He moored his two larger vessels in the shelter of the St. Charles River, which here flows into the St. Lawrence, where he proposed to spend the winter. In his smallest ship, the Emerillon, or Sparrow-Hawk, accompanied by a couple of long-boats, he then pushed on up the river to visit the great Indian town of Hochelaga, on the site of the present city of Montreal. 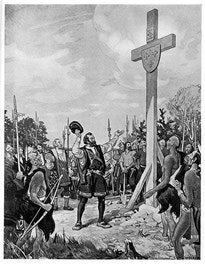 Cartier reached Hochelaga on the 3rd of October, 1535. He found it a collection of fifty bark-covered wooden houses, each about fifty paces in length by twelve or fifteen in width, and each occupied by several families. 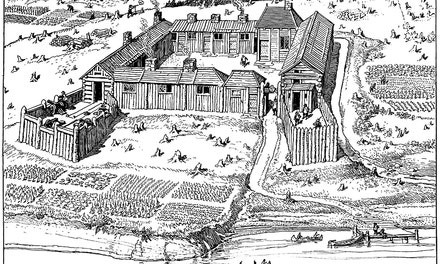 The village was built in a circle, and surrounded by a palisade composed of three rows of logs driven into the ground and well joined together. 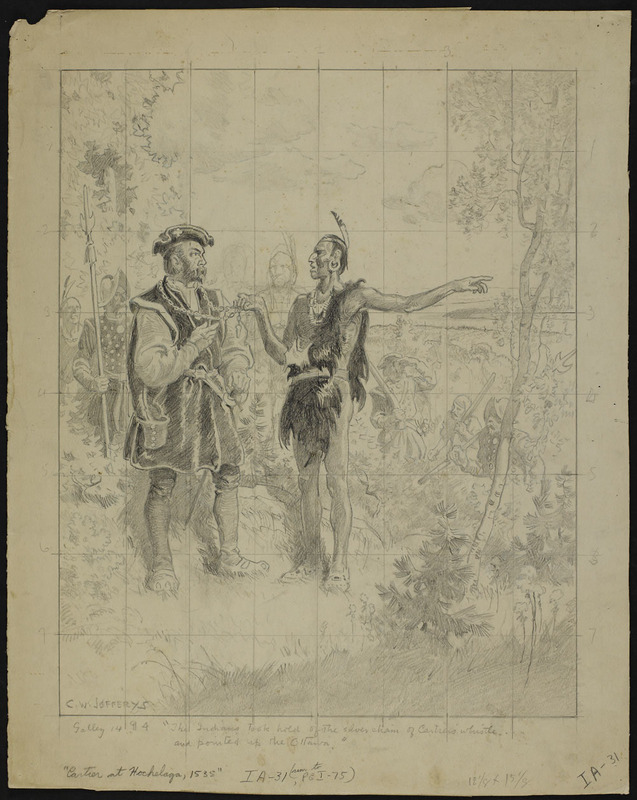 The Indians welcomed Cartier, and after he had visited the town, they conducted him to the summit of the near-by mountain in order to show him the surrounding country. They explained to him by signs the course of the St. Lawrence, and the junction of the Ottawa flowing in from the north. They told him that in addition to the rapids at the place now called Lachine there were three other great rapids and that after passing these one could travel by water for three moons. Cartier's own account tells us that the Indian chief, seizing the silver chain of the whistle hanging round his neck, which he used for giving signals on ship-board, and pointing to the handle of a dagger made of copper gilt like gold, worn by one of the sailors, gave him to understand that materials like these were to be found in the country from which the Ottawa flowed. 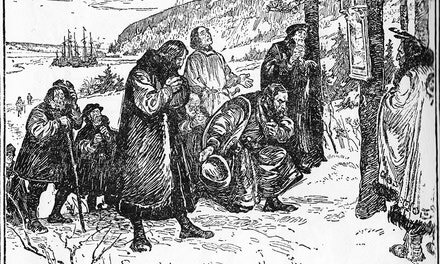 We have here the earliest mention of the mineral wealth of northern Canada, whose riches have been realized only in our own day, nearly four hundred years after the incident illustrated in the picture. Cartier wears a tunic reaching to the knee and belted at the waist, with a deep V-shaped opening at the neck which shows a white frilled shirt. Over this is worn an outer coat of heavier material, with loose hanging sleeves, into which the arms could be thrust in cold or stormy weather. His legs are clothed in skin tights, and on his feet are shoes of soft leather, with square toes, slashed with openings to show the bright-coloured inner lining. On his head he wears the low-crowned, flat Breton cap, with a narrow brim turned up all round, and fastened at one side with a metal brooch. There is no authentic portrait of Cartier, but the familiar picture of him that appears in many books seems to express his vigorous and self-reliant character. His figure is sturdy and weather-beaten from years of exposure, and he stands squarely on his feet, like a man accustomed to balancing himself on the deck of a rolling ship, for he had followed the sea since boyhood. His costume is gay and brilliant in colour, since, as he tells us, he had put on his best clothes for the occasion. The gentlemen of his company are equally gorgeous, while the soldiers wear highly-polished steel helmets, and thick, padded leather jackets on which are sewn glittering discs of steel, and are armed with pikes or halberts. Surrounded by the dusky Indians, and amid the glowing foliage oi the Canadian fall, and lit by the sunlight of a cloudless blue sky, the scene must have been suffused with intense and magnificent colour. After viewing the scene, the party returned to their boats, which were unable to go any farther up the river by reason of the rapids. Cartier therefore turned back to his winter quarters at Stadacona. During his absence his men had built a rude fort on which they had planted some cannon taken from the ships, for the Indians had shown signs of menace. Soon the winter settled down upon them, and the ships were frozen in. Scurvy broke out, and before spring came twenty-five of the company had perished. By the middle of April the ice broke up, and on the 6th of May Cartier set sail on his homeward voyage, abandoning one of his ships, for. owing to death and sickness, there were not enough sailors to man all three vessels. 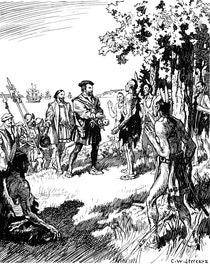 Before leaving he lured Donnacona, the chief, and some other Indians on board, and took them with him to France, where they arrived safely after a voyage of two months. The Indians conducted Cartier to the summit of the near-by mountain, from whence could be seen the course of the St. Lawrence, and the Ottawa flowing into it from the north. Cartier's own account tells us that the Indian chief, seizing the silver chain of the whistle hanging around his neck, which he used for giving signals on ship-board, and pointing to the handle of a dagger made of copper gilt like gold, worn by one of the sailors, gave him to understand that materials like these were to be found in the country from which the Ottawa flowed. 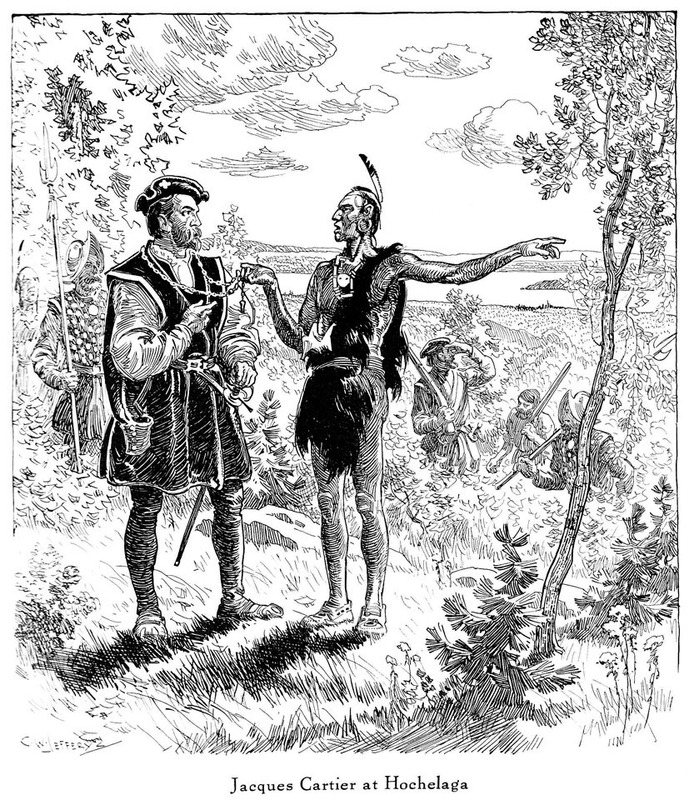 We have here the earliest mention of the mineral wealth of northern Canada, whose riches have been realized only in our own day, nearly four hundred years after the incident illustrated in the picture. During the winter of 1535-1536, which Cartier's company spent in the neighbourhood of Stadacona (now Quebec), they suffered severely from scurvy, a disease caused by eating too much salt meat, and the lack of fresh fruit and vegetables.